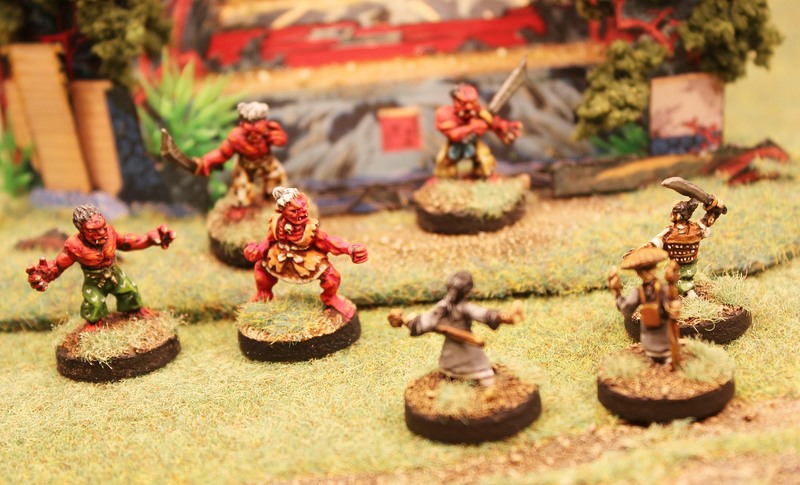 The biggest array of 15mm fantasy centred around Japanese myth and legend expands again with two new pack releases! 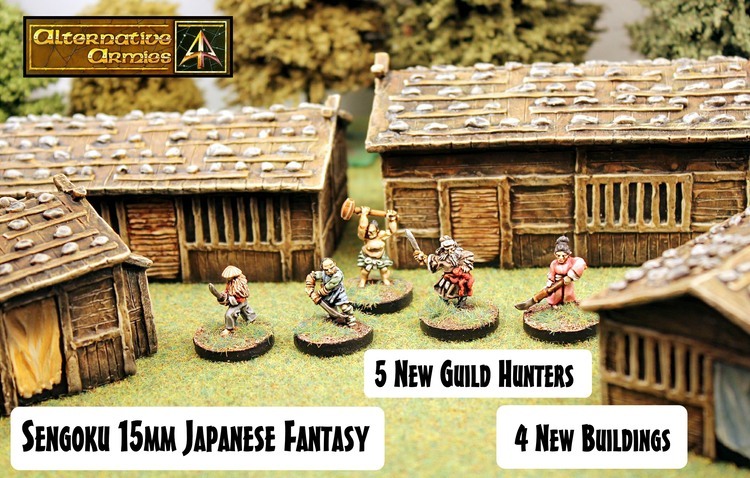 The Sengoku range welcomes a pack of five different Guild Hunters (these are also online as singles as with the rest of the range) sculpted by Sam Croes; characters for your games of Monster Hunter by Steve Danes. Four new Japanese buildings sculpted by John Bell great for use in Monster Hunter or any historical game in this scale. The buildings can be had a singles and there is a pack of separate shutters too so you can button up your homes against the Yokai! If you have not heard of the Sengoku range by John Bell then check it out with over one hundred and thirty codes HERE. This pack contains five different white metal 15mm scale character miniatures. Famous Monster Hunters for use in your games who will be given profiles later in 2019 in Sengoku Rampage. They are: Takemito the Sumo, Tomoe the Spear Lady, Miyamoto the Duellist, Sanada the Yokai Chaser and Shoki the Demon Queller. Taken from codes SGF103 to SGF107. Average of 16mm tall. Sculpted by Sam Croes. You can purchase the pack HERE or visit the main Sengoku page to get the single miniature codes HERE. This value pack set contains four different high quality grey tone resin buildings. Each is a highly detailed one piece scenic for your gaming table. For use in Sengoku Monster Hunter or any historical period 15mm Japanese system. 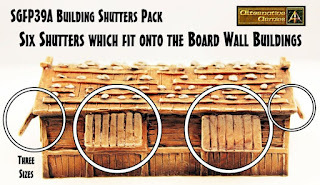 Two small board wall buildings (each 50mm wide, 75mm long and 40mm tall average) and two long board wall buildings (50mm wide, 100mm long, 45mm tall average). Sculpted by John Bell. 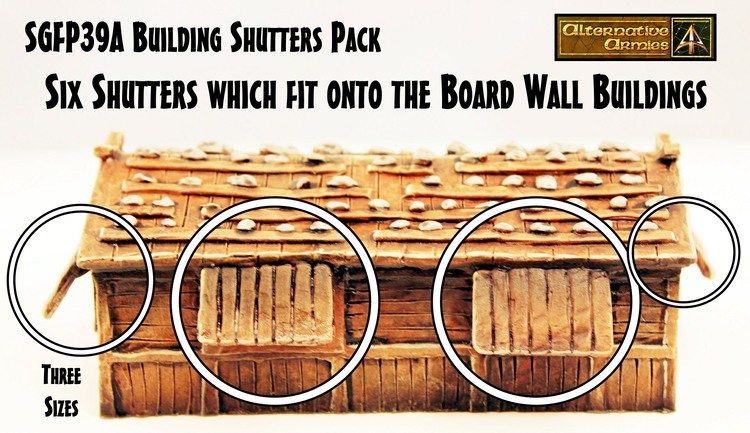 There is an additional code (SGFP39A) of white metal shutters for use with these buildings if you wish to cover the windows. 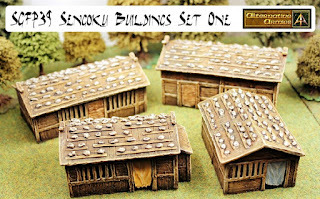 You can purchase the set HERE or visit the main Sengoku page to get each building on its own HERE. 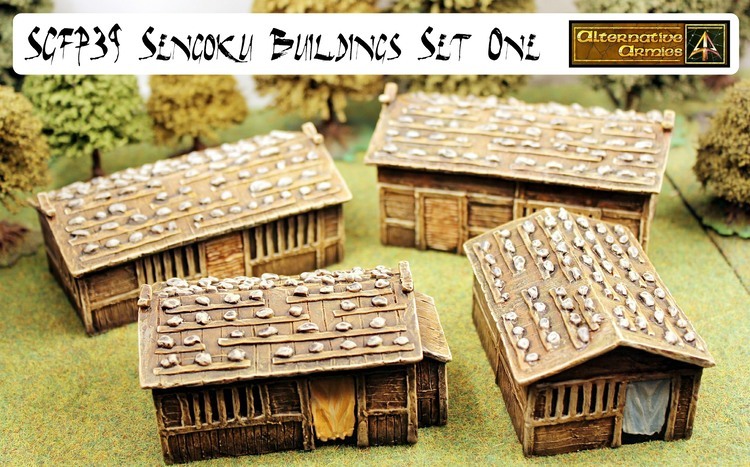 This pack contains six white metal pieces in three different sizes for use with the SGFP39 Sengoku Buildings. They are to be placed over the windows of the building propped open or closed giving more life to your village. You can also use them as diorama pieces. Sculpted by John Bell. Go HERE. 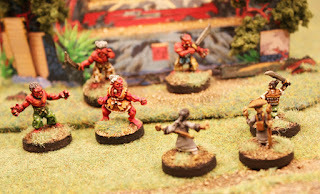 Sengoku Monster Hunter is a Tabletop Game for up to Four Player or Solo Play using the Sengoku range of 15mm miniatures. 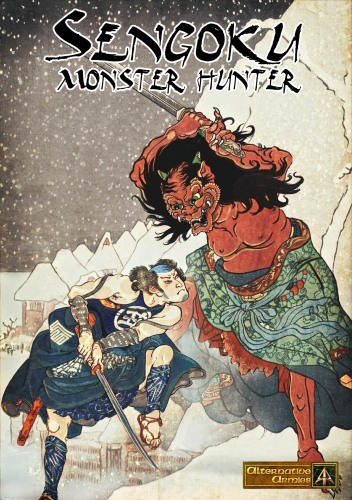 A game for one to four players set in medieval Japan where monsters and creatures of myth roam the jagged crags and hidden valleys of the Sacred Mountain. It is from the Sengoku setting and has merciless hunters who track down the monsters and slaughter them at every opportunity. Hunters are the players characters in the game. Each hunter has a profile of attributes, skills and special abilities that players can improve if their hunters are successful. There is a range of weapons, armour and equipment that hunters can acquire as well hired henchmen, spirit guides and others to assist them in their expeditions. The more powerful the hunters get…the greater challenges they can take on! Author: Steve Danes. A4 Format (52 pages). Get it in PRINT or as a paid DIGITAL DOWNOAD. There will be further releases into this range during the course of 2019 and there will also be a second game book too. We will show and tell you more when the time comes. Thanks for Reading.